I am not much of a Make-up Person, But yes I do love to sit in front of my dressing table and pretend I am doing Make-up. Hah! I'm more of a Minimalist, I'd play with Eyes or Cheeks... I detest Dark, Waxy Lipsticks. I'd just put on some Kajal or winged eyeliner with a soft tinted lip balm for College. I've used Lotus 3-in-1 Matte look as Base. For eyes, I've blended 1.Base ie Mint Colored Eyeshadow with the sponge applicator provided with quad on the crease, avoided going overboard. 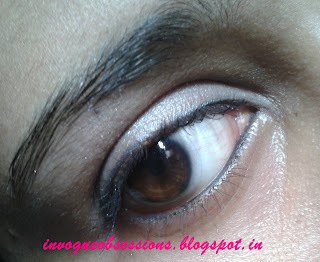 I blended 4.Liner ie Gunmetal green on the corners. Avoided going overboard too. Tightlined my eyes using Colossal Kajal and lined my Lower lids too. I've concealed Kajal using 4. Liner from the quad. Single stroke of Mascara on my lashes and two swipes of Color Bloom on my lips. A Light Mint colored sweep on my Lids. I'm scared of FOTDs, But I don't know how I have the heart to post them. I love that maybelline mascara! good job! 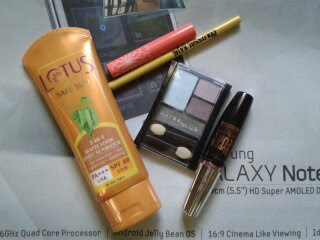 and i also prefer the lotus sunscreen as a base..!! love it..